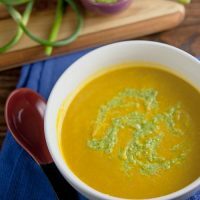 Make this chilled carrot soup the night before, and you’ll be all set with a simple yet elegant weeknight meal. Swirl in an easy pesto made from garlic scapes and pistachios for extra flavor! The other day I was helping pick out a menu for an event at work when one of the appetizer options caught my eye. Chilled carrot and yogurt soup with toasted cumin and almond oil drizzle definitely wouldn’t work for the event, but I couldn’t stop thinking about it. I grabbed a post-it and scribbled down the description so I could make something similar at home. The soup was pretty good just like that, but I wanted to serve it as a main course and it needed something else to take it over the top. I swirled in some pesto that I made with garlic scapes from the farmer’s market (20 for $1 – get ’em while you can!). Perfect. 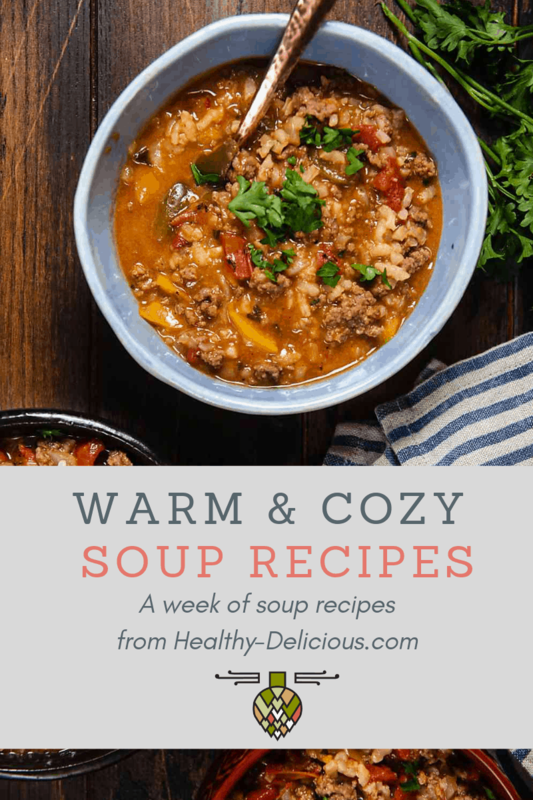 This soup is really thick and filling and the flavors are intense – a little goes a long way so you only need about a cup of soup per person. With bread or another starchy side, it’s a great light meal. I served it with oven fries that I tossed with minced shallot, lemon zest, and parley and suggest that you do, too. Heat the olive oil in a large soup pot set over medium heat. Add the leeks, garlic, and cumin. Cook, stirring occasionally, until soft – 5-7 minutes. Add the carrots and vegetable broth. Bring to a boil and cook until the carrots are soft – about 30 minutes. Transfer the soup to a blender, working in batched if necessary, and blend until smooth. Chill at least two hours. Just before serving, stir in the coconut milk. Swirl 1 teaspoon pesto (recipe follows) into each serving of soup. I’ve never had garlic scapes before but love the sound of that pistachio pesto! 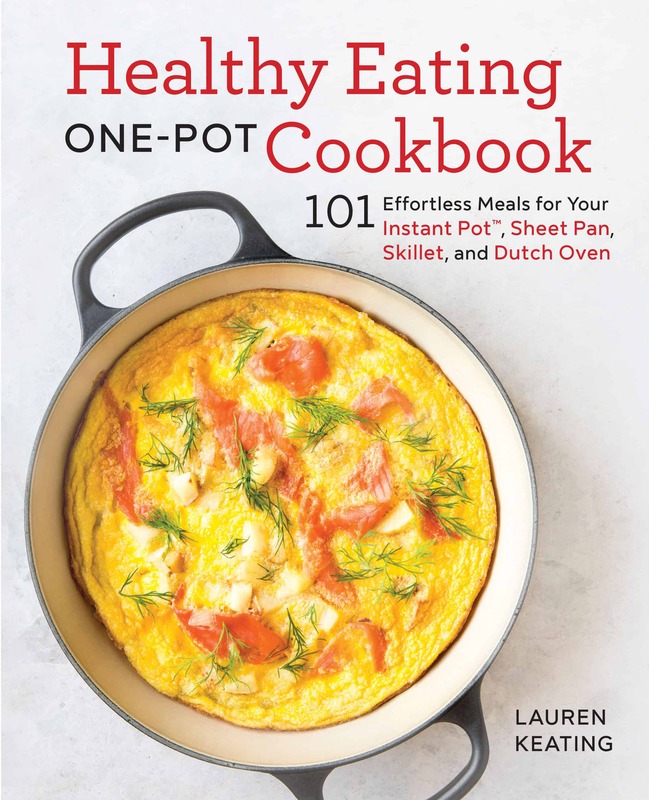 This soup is downright gorgeous, Lauren! I must be craving some vitamin in carrots because they have definitely been on my mind lately!! Love this chilled soup with all these rich flavors. So summer perfect! What gorgeous soup, Lauren! Love the flavor and colors! Oh, Mylanta! I’ve had carrot soup with pistachios before. SOOO Yum! 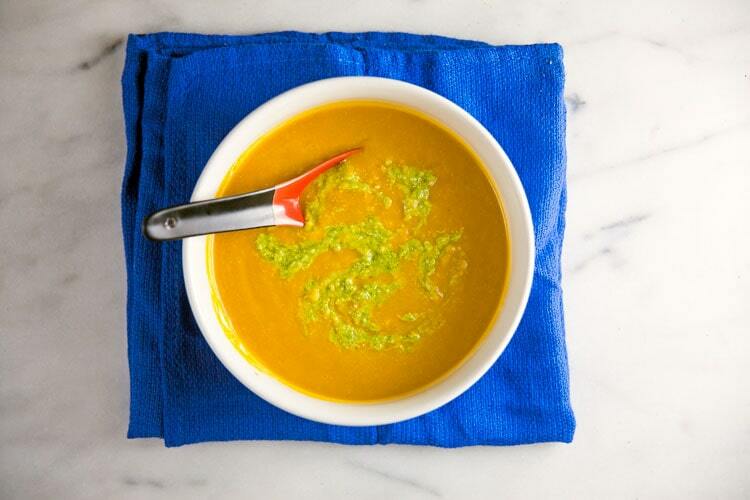 Love this pesto with the soup. JUST LOOOOOOVE IT! Garlic scape pesto is my most favorite! 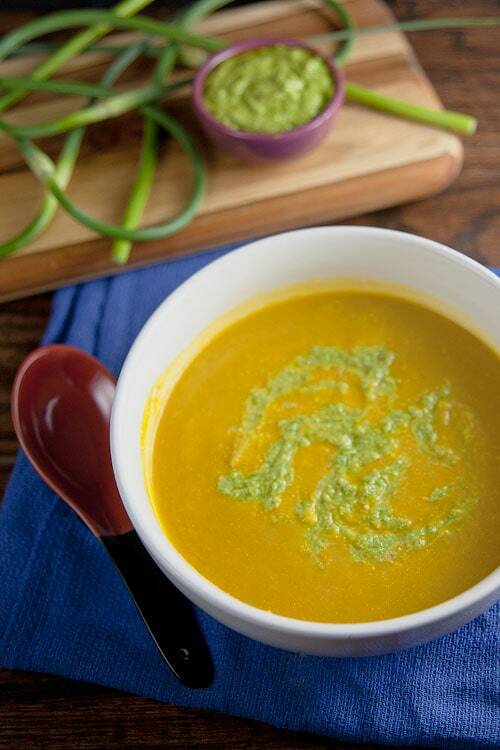 I love that you used it on this chilled carrot soup…yum! Squee, this is gorgeous. And I just happen to have tons of garlic scape right now. I’m going on a scape recipe tear tomorrow. I’m so, so in love with this! Dinner Sunday? Probably! Gorgeous! The pesto alone sounds fantastic! This soup looks so gorgeous! Soups are perfect idea for lunch or dinner. After eating them we don’t feel hungry for long time. Your soup is vitamins bomb. I’m seeing scape in so many recipes, I must get my hands on some too! Looks great! I’m kinda in love with this! Love this complete recipe and the addition of pistachios and nutritional yeast. Just great! This is fabulous and just my kind of soup! I have some late scapes too! Yum!! I have made carrot soup but never had it chilled. I bet it’s delicious! And that pesto… what a great addition!! 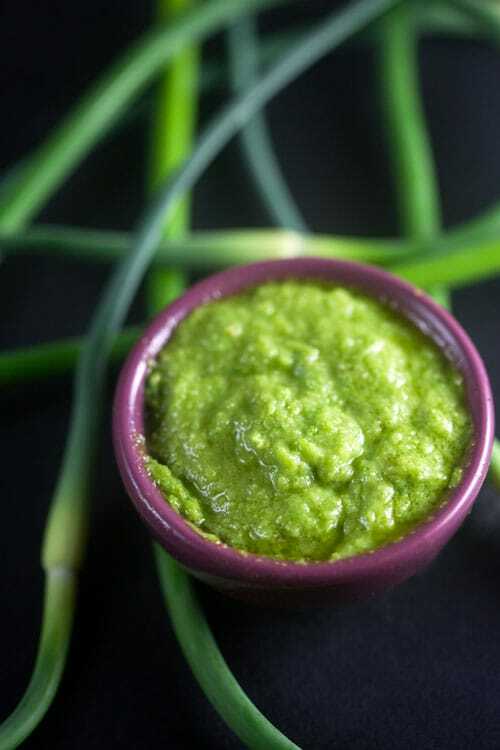 I hadn’t thought of adding pistachios to garlic scape pesto – great idea!